For the last 9 years, this outfitter has proven to be very successful for our clients — and also are fun people to work with. They have quite a variety, ranging from excellent black bear hunting in spring and fall, to Atlantic salmon fishing spring through fall, to superb striped bass fishing, to good bird hunting and some inexpensive deer hunting too! 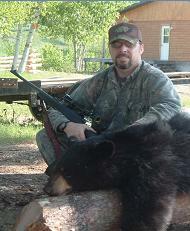 Their spring bear success is normally about 90% to 100% – our first group of clients was 5 bears for 5 guys. Our next group was also close to 100% the next week. Very similar patterns in subsequent years as well. And the fall hunts are equally productive, and you may be able to include some grouse hunting and striper fishing. Their striped bass fishing is WORLD CLASS! Very new- very untapped! Days of 50 to 100 fish are not unheard of! Spin fish, troll, and we suspect even fly fishing may prove fun. Stripers run 5 to 40 pounds, with most in the 8 to 20 pound class! This is the only breeding area for stripers in that province, so about 300,000 of them flock here in LATE MAY AND JUNE. 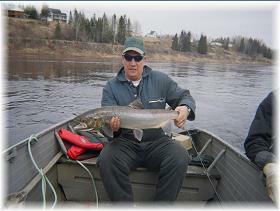 Atlantic salmon fishing (flies only, catch and release) can be excellent, or not, but that is the nature of Atlantics! Sea-run trout are also a possibility and can reach 10 pounds. BIG NEWS: In 2014 they upped the bear limit to 2 bears! But you must book both bears initially to get the good price and secure tags. 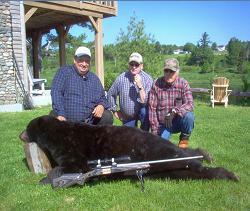 These folks have been at or close to 100% success on bears for many years. With the new 2014 two bear limit, you can shoot the first good bear you see and then hold out for a bruiser on the second tag. They maintain many bait stations; far more than needed. The main Lodge is practically new, of peeled cedar logs, with a gorgeous stone fireplace. The Miramichi River is right in front of the lodge, so a hot shower, and then sitting on the porch with a cold beer, is a fine relaxing time. THEY VERY RARELY HAVE ANYONE GO HOME WITHOUT A BEAR! Bears will average between 5 to 6.5 feet, meaning nice mature bears in the 200 to 250 pound range, and some much larger. We like the surroundings here, the nearby river and forest, the comfort and the food! Friendly folks, nice lodging, good food, fishing out the front door, and plenty of bears, and very close to the eastern seaboard. And all this at an incredibly reasonable price. Spring bear is also prime striped bass fishing time and salmon may be around too! So a cast and blast can be done! Spring bear usually starts mid-April and runs to the end of June. One thing: spring in the North is bug season. This means insect repellent, gloves and face masks, but buy and bring along a ThermaCell as well – they are amazing at keeping you bug free! About $30 last we looked. Fall bear is normally less buggy, and success is about the same as spring (meaning high), and you have the advantage of adding in a day or two of grouse hunting or fishing. Fall fishing is fly rods only and salmon season is roughly September 1 to October 15; bear season for gun is September 1 through to the beginning of November; fall bow season is the last week of September; bird season (ruffed grouse and woodcock) opens the beginning of October – just walk the roads! Deer season for bow is Oct 2-Nov 18l for rifle: Oct 23-Nov 18.
and call it 20 or more. You are allowed to keep three stripers, which can be a lot of poundage of some delicious fish! WE WOULD LOVE TO EXPLORE THIS FISHERY AND TRY FLY RODDING AS WELL AS USING CONVENTIONAL TACKLE! If fishing tidal waters, no fishing license is needed. Common sizes for these stripers are from 8 to 20 pounds, but many larger fish are also caught- reaching up to 40 pounds! The outfitter has aluminum skiffs with 25 horsepower motors and you will troll and cast for the fish. Currently most of the fishing is done by trolling or casting- that tends to produce the 30 plus pound fish. Many years ago Butch recalls trolling the Hudson River Spring spawning runs of stripers, using deep diving stick baits and just hammering big stripers. Gotta wonder what this area would produce?!! And you can do this fishing trip, complete with boats, motors guide and lodging- for only a bit over $2,000 per man!! Awesome. system. Truly, this river is a world treasure, but it gives up its salmon reluctantly. SPRING AND FALL FISHING FOR SALMON IS BASICALLY FLY FISHING ONLY – although there is some trout fishing you can do with barbless lures; and there is some early spring fly trolling that anyone to do, and some good striped bass fishing as well. Stripers are caught by trolling, and 20 to 40 fish a day is very possible, in the 5- to 30-pound range (you may keep 3). But if you tag your bear early (good chance), the fishing will keep you busy! (BUTCH NOTE: Low water in recent years has meant that the salmon fishing has been very slow, but that’s Atlantic salmon fishing! But the striper fishing is world class!!!!! New Brunswick’s famed Miramichi River needs no introduction to most fishermen. The river hosts generally a very strong run and solid population of Atlantic salmon. Fishing is good most of the year, with kelts or “black salmon” being caught in April and May (fish that spawned in fall, wintered over, and are feeding heavily as they drift back to saltwater). The early spring Salmon fishery (before bear season) is more in the nature of a boat fishery (trolling flies), so even a non-fly fisherman should be comfortable hauling flies behind the boat. Dates of the run back downstream for Atlantics (fish that have spawned and are returning) vary widely from year to year, but figure early to mid-April to early May. Mature adult Atlantic salmon spawn in the fall and over-winter in the river. In spring, after the ice melts, the kelts feed heavily on smelt and migrate out of the river between ice out and the end of May. After that begins the regular runs, and what follows is a general guide. Around late May and early June, fresh silvery Atlantics start returning. At that time you will catch both mature Atlantics and also the smaller immature grilse. THIS TIME OF YEAR MEANS FLY FISHING ONLY FOR SALMON . However stripers have no such restriction! From April 15 to June 1, the salmon guide ratio is 1:1. Five to 10 salmon days are not unusual. And it is also excellent bear hunting at the same time. If you are not a fly fisherman, they will take you downstream for spin fishing for striped bass. You can spin fish for the striped bass and sea run trout using barbless hooks. THREE STRIPERS IS THE LIMIT. Striper fishing is usually very good to superb, and fish can exceed 30 pounds. 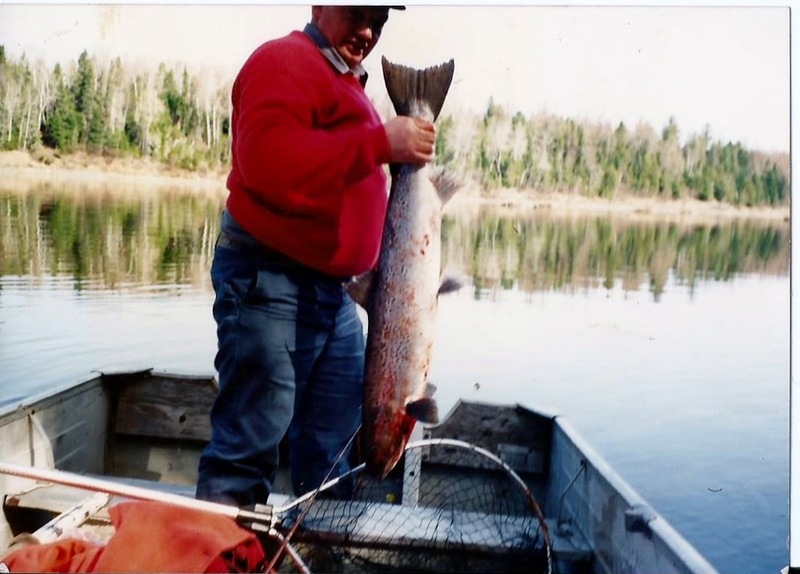 lodge include the Main Southwest Miramichi River, the Renous River and the Bartholomew River. New Brunswick has produced a number of very large deer, but at present we consider the deer hunting there to be good, but not necessarily a trophy hunt. But these are huge bodied Canadian bucks, and they can carry some impressive horns. However we think being conservative is the better approach and we think expecting mature bucks in the 6 to 8 point range will be the norm; with a chance for a large buck always there. And these buck hunts are a true bargain for a Canadian deer hunt! You get a fully guided deer hunt, including good meals and lodging, baited stands and experienced local guides, all for a bit over $2000 !!! We think the deer hunting should be of interest to those wanting a new experience and some good organic meat, and just maybe some really nice horns as well. Stands will all be pre baited and pre-scouted before you ever arrive. This should be a fun hunt. This fall, 2019 will be our first with their deer program, so we are being conservative in our predictions, but honestly a guided deer hunt in Canada for this kind of money just has to be fun! Typically, whether by bow or gun, you will often sit over bait piles. The lodge monitors them carefully to insure you are put on active baits. All meals are homecooked and very hearty! 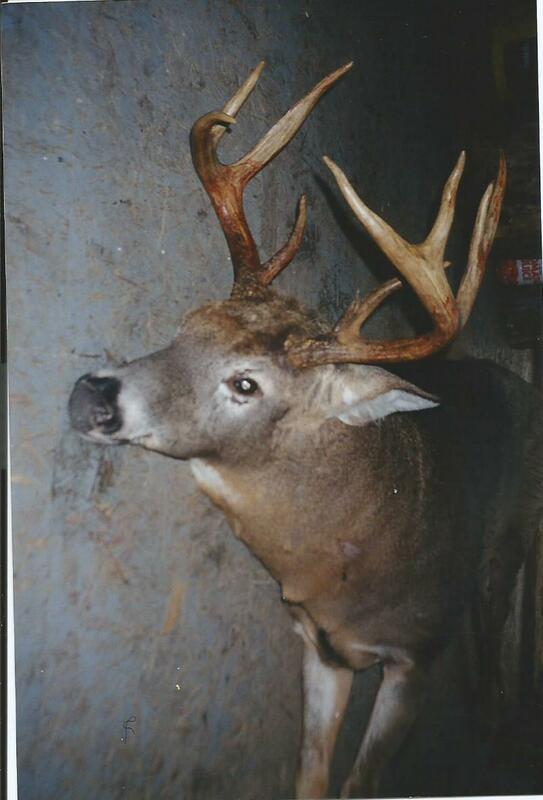 Your average buck here will be 6 to 8 points, with huge bodies, often reaching 240 to 300 pounds on the hoof! That’s a pile of venison! 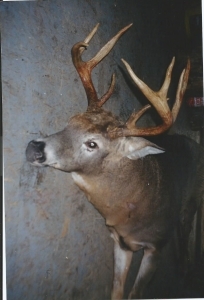 The deer season for bow is Oct 2 to Nov 18; and the rifle season is Oct 23 to Nov 18. All hunters must wear orange- even bow hunters. Please note that bear may be also hunted during part of this time. The limit is one buck with visible antlers. You can also hunt during mid-day along the roads for Spruce Grouse and ruffed grouse, with a limit of 6 per day. A nice break during the mid-day. They place you on stand and retrieve you for lunch, then do the same in the afternoon. In the evening a great hot meal is served. And they will retrieve, field dress, skin and provide cold storage for your venison. Stands are usually metal tree stands or ground blinds. They hunt zones 7, 13 and 14. 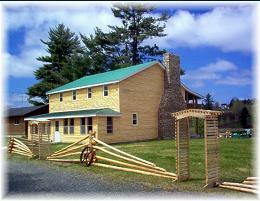 LODGING: There are two main accommodations. The Main Lodge (aka “the big camp)”, overlooks the Main Southwest Miramichi River with a large veranda to relax on. It was built in 2000, has 7 bedrooms sleeping 14, a large open plan living and dining room with 14’ stone fireplace, two bathrooms, and full kitchen. The walls are adorned with trophy bucks, moose, bear hides, and more – there is no mistaking that you are staying at an outfitters lodge. It’s a great talk-piece. “The New Camp” was built in 2005 and has 5 bedrooms sleeping 12, full kitchen, combined living and dining room and two bathrooms. Located a bit further back from the river, it’s not river view, but has lots of space and a veranda. The river is still handy (a stone’s throw away) and accessible. When staying with them your towels, face clothes, linen, dishes, pots, pans, utensils, and barbeque with propane are provided. This trip is an easy drive for many folks in the eastern US. Heck of a deal too! Realize that many guys spend $4000 and more to fly fish for Atlantic Salmon! Also good striped bass fishing with spin gear. 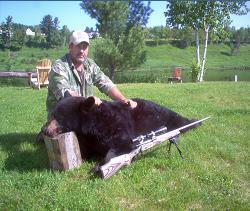 And with great high success bear hunting also available, you have all your needs in one place! TRAVEL: Fly to either Fredrickton or Moncton, NB. Airport pickup and return is a modest $40 roundtrip!! Or drive. Remember, you must work with us to get your Canadian gun permit- very simple procedure, we have done it many times! Cost was about $25 last time we looked. GUN IMPORT PERMIT : YOU MUST SECURE A GUN IMPORT PERMIT TO BRING IN YOUR FIREARMS. IT IS EASY AND SIMPLE AND COSTS ONLY $25. GO TO THIS LINK IN ADVANCE TO GET IT: http://www.rcmp-grc.gc.ca/cfp-pcaf/fs-fd/visit-visite-eng.htm DO NOT SIGN THE FORM UNTIL IN FRONT OF THEM! License costs (approx. ): Bear: $163 plus tax. Outfitter will assist; you supply the info for licenses. 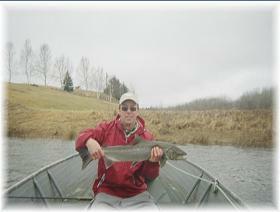 Salmon fishing license: 3 day $61 plus tax; 7 day $115 plus tax. The outfitter will need a copy of your driver’s licenses, and a New Brunswick Outdoors Card. • All gun hunters born on or after January 1, 1981, and all first-time gun hunters must complete a Firearm Safety/Hunter Education course, somewhere- usually your home state..
• Gun hunters who were born previous to January 1, 1981, and who are not first-time hunters, may show a previous hunting license as proof of experience. • All persons younger than 16 must show proof of having taken a firearm safety and hunter education course, and be accompanied by an adult while hunting. • All bowhunters and crossbow hunters must complete a recognized stand-alone Bow Hunter Education course or have proof of a previous hunting license allowing use of a bow or crossbow. • Firearm Safety/Hunter Education and Bow Hunter Education certificates from other provinces, territories and the U.S. are accepted. Airport pickup $150; bear license $163 CAD per tag. ½ day fishing $150 approx. 5 DAYS, 6 NIGHTS $2199 !!!! BARGAIN! Includes: Guiding, meals, lodging, game retrieval, skinning and cooling. You can bird hunt in mid day by driving roads. It may be possible to add on a bear or fishing. 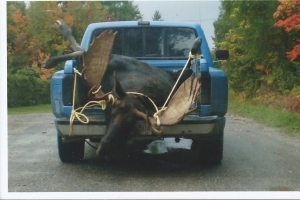 MOOSE – $5,999 1×1 guiding. You must apply and draw a tag. Please inquire for details. 50 TAGS TOTAL. BEAR EQUIPMENT NOTES FROM BUTCH: We Strongly suggest good bug protection, especially for sitting for the bears. Black flies AND skeeters can be obnoxious. Buy and bring a Thermacell with refills. About $40 last time we bought one—but worth its weight in gold! All the major retailers sell them. Face nets, gloves too. Raingear too. Choice of gun or bow and ammunition, rain gear, sunglasses, hunting gear, mix of warm and light clothing that you can layer. Remember, ask us for the Canadian gun import forms. Very simple- honestly! ( But– If you ever had a felony or serious arrest, or a DUI or drug problem- talk to us before booking. You will need to go through some procedures that can take several months to complete.) Otherwise it is a piece of cake- about $25 and 5 minutes! For the bear license, the lodge will need your name, address, telephone number and birth date. They usually also need a Firearms Safety Card (NRA) or bring along a current hunting license from elsewhere. They will take you to get your licenses, once you arrive. We understand that US Passports are required. Get applications from Post Office- takes some time! You will also need a US Customs form 4457- again easy and no cost to obtain. It simply is proof of ownership from US Customs. Mandatory basically! Go to nearest US Customs office – bring gun along.